Tobbie the six legged robot is a kit which the kids will have great joy in putting together and see it come to life! The cute little friendly robot has two pre-programmed modes; to follow or explore. In "Follow" mode, Tobbie follows the object like an obedient pet. In "Explore" mode it scans for new path to keep moving. Create your own maze and challenge its AI (artificial intelligence) to follow you. 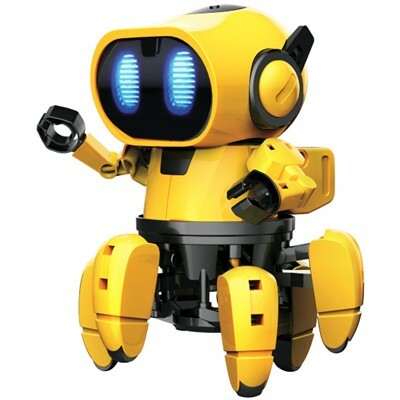 The little robot gives lively entertainment with its cheery sound and light effect. Approximate 108 parts. Tools you may need: diagonal cutter and screwdriver.